Included in the “1st USJ Forum of Counseling and Psychotherapy”, this round table will address the theme of the professional borders and identities in the field of psychology and counselling. The access to the professions of “psychologist”, “clinical psychologist” or “counselors” is not always clear for most of undergraduate and graduate students. The University gives to the students an academic certification. But to what professions they can access with that academic certification? In the same way, who can access to the different professions? This last question is particularly relevant to the “counselors” as different professionals are doing counseling (e.g. psychologists, social workers and teachers). But even for that, a Master in Counseling shouldn’t be required? On the other hand, what is expected for each professional to do? What can a clinical psychologist do that a psychologist, not clinical, cannot? And a counselor, what he can and not do? And, more that, how can they articulate and be complementary to each other? And finally, who regulates this? We know that the “Health Bureau Service” regulates the access to the “clinical psychology”. And what about the “psychological intervention” or “counseling intervention”, who’s making or should make the regulation? 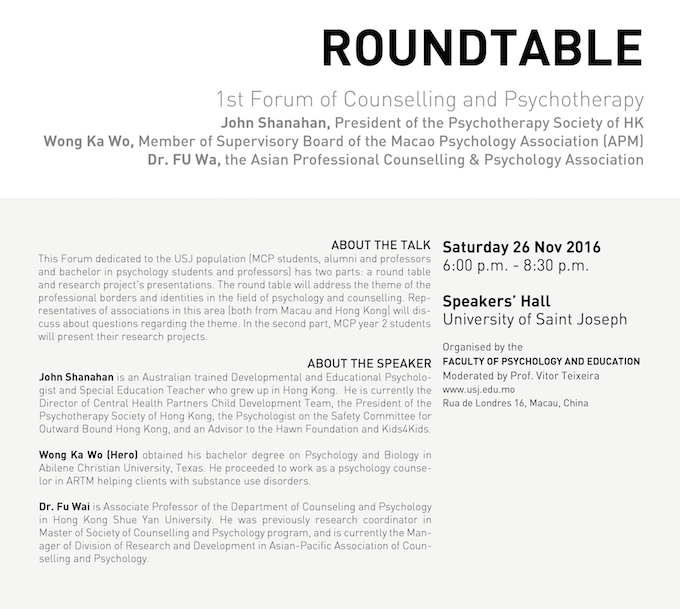 For this round table dedicated to the USJ population (MCP students and alumni, bachelor in psychology students, professors of the MCP and bachelor in Psychology) we invited representatives of associations in this area (both from Macau and Hong Kong) to help us to find some answers to these questions. John Shanahan is an Australian trained Developmental and Educational Psychologist and Special Education Teacher who grew up in Hong Kong. He has more than ten years experience working with schools and families in Hong Kong in private practice. He is currently the Director of Central Health Partners Child Development Team, the President of the Psychotherapy Society of Hong Kong, the Psychologist on the Safety Committee for Outward Bound Hong Kong, and an Advisor to the Hawn Foundation and Kids4Kids. In addition, he is an Executive Committee member for the Dyslexia Association of Hong Kong and a Visiting Professor in the Master in Counselling and Psychotherapy at the University of St Joseph. Wong Ka Wo (Hero) obtained his bachelor degree on Psychology and Biology in Abilene Christian University, Texas. He proceeded to work as a psychology counselor in ARTM helping clients with substance use disorders. His great passion in the field gives him an opportunity to work in Department of Social Rehabilitation of Macau SAR to serve in a wider context. In the meanwhile, he pursued his master degree in Counseling and Psychotherapy in the University of Saint Joseph. Currently, Hero is working in SAFP (Department of Administration and Public Service) and serves the position of Member of Supervisory Committee in Macau Psychology Association. Dr. Fu Wai is Associate Professor of the Department of Counseling and Psychology in Hong Kong Shue Yan University. He was previously research coordinator in Master of Society of Counselling and Psychology program, and is currently the Manager of Division of Research and Development in Asian-Pacific Association of Counselling and Psychology. His research interest include prevention of gambling addiction. He was presenting at the symposium in ICP 2016 on indigenous and critical psychology in Hong Kong. Dr. Fu Wai’s research interests include historical investigation of changing perception of psychologist in Chinese societies, and study on counselling needs in Hong Kong.